Spending for education technology is up this school year, continuing a rise that started last year following three years of recession thrift. More districts expect to increase their hardware and software spending from 2014-2015. However, overall teacher training and tech support budgets have dropped slightly. The expansion of instructional technology is being driven by an increase in online testing, "marketplace demand," and sheer innovation. Those details are tucked inside the considerable findings of this year's 500-plus-page "State of the K-12 Market 2015," published by EdNET Insight. The report's authors culled data from a number of sources, including the company's own surveys. For the latest report, data was solicited from 287 technology administrators and 280 curriculum directors online and by phone from March through May 2015. According to the report, while about half of the districts are "holding fast" to last year's technology budget increases with no changes expected, between 27 and 46 percent hope to up their spending this school year. Only 8-12 percent are working with decreased budgets. The technology budget outlook for all districts in 2015, 2014 and 2013. Published with permission of EdNET Insight. The biggest areas of expansion are hardware (46 percent of districts will see more in this category) and teacher training (38 percent). 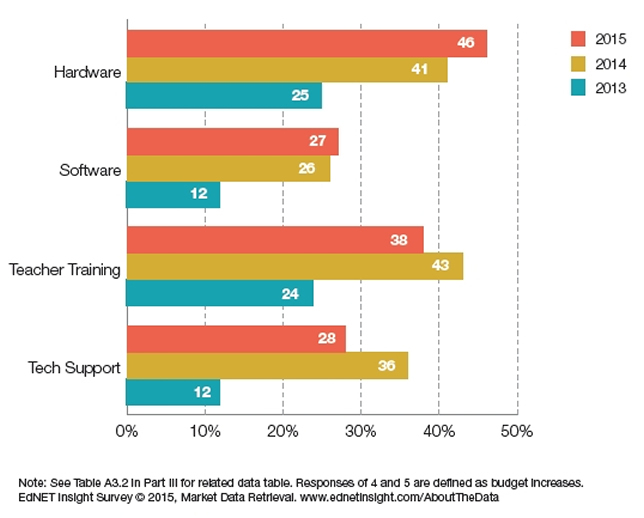 At the same time 28 percent of districts are boosting software budgets and 27 percent are increasing tech support over the previous year. On the hardware front, tablet purchases are planned for nearly nine in 10 (87 percent) districts. As the grade level goes down, the investment in tablets goes up. At the K-2 level, 68 percent of districts intend to purchase tablets; at the 3-5 grade level it's 56 percent; for middle school it's 40 percent; and for high school it's 36 percent. Laptops will see almost as much buying activity — 86 percent of districts have them on the shopping list. However, the pattern is reversed. While 68 percent expect to buy laptops for high school, only 30 percent are getting them for K-2. Purchases of desktop computers are holding strong too; 83 percent of districts expect to get more of those this school year; and 77 percent have budgeted to acquire Chromebooks, which the report stated has become the go-to device for mobile learning. While tablet purchase as a priority fell to 31 percent of districts, Chromebook acquisition specifically jumped by 17 percentage points in 2015 and has become a high priority for 49 percent of districts. 45 percent plan to add interactive displays. In the category of curriculum, the use of digital content is continuing to grow in schools. "The shift from print toward digital materials will continue, and districts are clear on what they expect from those materials — they must support personalized learning (92 percent), include an assessment component (90 percent) and be compatible with multiple devices and operating systems (90 percent)," said EdNET Insight Senior Director, Kathleen Brantley, in a statement. Though print is still important for schools, she noted, competition is coming from multiple directions, including open educational resources, the growth of project-based learning and flipped classes, and new technology providers entering the market. A fifth of districts (21 percent) report that their high schools have bring-your-own-device programs in place, primarily for Internet researching (88 percent), followed by formative assessment activities such as polling and quizzing (84 percent), collaboration (71 percent); skills development and practice problems (60 percent) and accessing online curriculum (56 percent). The survey found that a majority of districts (69 percent) offer online course options, with a 50 percent increase in the number of classes offered this year over last year. The primary model is blended learning, used at 59 percent of districts vs. 41 percent that favor fully online courses. Districts Are Gravitating to Online Assessments. In spite of a healthy "opt-out" political movement against the use of the Common Core, one aspect of those state standards that's holding fast is the presumption of online assessment. As the report stated, districts made "significant progress" in shifting to online testing. The number of districts administering the majority of summative assessments for their core subjects online grew by 20 percentage points to 54 percent in 2015. Similar results have surfaced for benchmark assessments (58 percent of districts are using online versions) and formative assessments (56 percent). That doesn't mean paper-and-pencil testing is dead; almost half of districts (49 percent) said this method was still important for the benchmark assessment buying decision. Data Analytics Is on the Uptick; So Are Security Concerns. While more than nine in 10 districts (92 percent) use data analytics systems to glean usable insights (compared to eight in 10 in 2014), their concerns over privacy and data security have also risen. Eighty percent require contract language that spells out the vendor's security and privacy policies. The report is available for $7,500 from the EdNET Insight Web site.